Fear and uncertainty that drive a severe bear market are the same emotions which can set the stage for authoritarianism, in most any nation. Why do authoritarian tendencies emerge only during bear markets in stocks? Bob Prechter’s new science of socionomics explains that stock market fluctuations mirror trends in people’s collective mood. In simple terms, when the market is buoyant, it indicates positive social mood; the opposite when a bear market takes over. The fascinating part is that because the stock market and social mood trend closely together, a forecaster can apply Elliott wave analysis to both — and predict both. Generally, widespread brutalities and wars do not follow the first phase of a bear market. Extreme violence, when it does occur, often follows the worst part of the market’s downturn — like the end of the Great Depression, a negative social mood period that ultimately ushered in World War II. But even during the first phase, a negative social mood grows. So, if a forecaster determines correctly where in the wave structure social mood resides, he can make educated forecasts about what will follow in society — given what has happened before under similar social mood trends. Authoritarianism is a subject of heated discussions these days, which makes it a timely topic for a socionomic study. The latest, two-part issue of the monthly Socionomist gives you just that: A look at historic trends and specific forecasts for the years ahead. The firm’s history suggests its vulnerability in periods of negative social mood. In the November 2009 issue of Elliott Wave International’s monthly Elliott Wave Financial Forecast, co-editors Steven Hochberg and Peter Kendall published a careful study of Goldman Sachs history — and made a sobering forecast for its future. Here is our special report, Part III. With the market’s downtrend recently in abeyance, these transgressions failed to capture the imagination of the public or the scrutiny of law enforcement. But the extreme recriminatory power of the next leg down in social mood suggests that Goldman’s dealings will become a lighting rod for public discontent. In January 2008, Elliott Wave Financial Forecast noted that Goldman’s success relative to the rest of Wall Street pointed “to the eventual appearance of a much larger public relations problem in the future. In the negative-mood times that accompany bear markets, conflict of interest charges will come pouring out.” The recent revelations about Paulson’s and Friedman’s actions are exactly that to which we were referring. Additional claims against Goldman — including front-running its clients and profiting from inside information — are already too numerous to mention. As the bear market intensifies, the firm will attract scrutiny as easily as it brushed it off in the mid-2000s. Based strictly on the form of its advance, a July 2007 issue of The Short Term Update called for a peak in Goldman shares at $234. Goldman managed one more new high to $250 in October 2007; it then fell 81 percent to a low of $47 in November 2008. The stock market’s wave 2 rise brought Goldman back to $193 on October 14. Its affinity for marching in lock-step with the DJIA strongly suggests that Goldman will decline to below its November 2008 low. Another key socionomic trait is for the most successful recipients of bull-market goodwill to be singled out for special treatment in the ensuing decline. Even fellow financiers are taking aim. In a not-so-veiled reference to Goldman, one Wall Street titan said that big profits made by investment banks are “hidden gifts” from the state, and resentment of such firms is “justified.” Let the bloodletting begin. The following article is adapted from a special report on "Popular Culture and the Stock Market" published by Robert Prechter, founder and CEO of the technical analysis and research firm Elliott Wave International. Although originally published in 1985, "Popular Culture and the Stock Market" is so timeless and relevant that USA Today covered its insights in a recent Nov. 2009 article. For the rest of this revealing 50-page report, download it for free here. This year’s Academy Awards gave us movies about war (The Hurt Locker), football (The Blind Side), country music (Crazy Heart) and going native (Avatar), but nowhere did we see a horror movie nominated. In fact, it looks like Sweeney Todd, The Demon Barber of Fleet Street was the most recent to be nominated in 2008, for art direction (which it won), costume design and best actor, although the last one to win major awards for Best Picture, Director, Actor and Actress was The Silence of the Lambs in 1991. Whether horror films win Academy Awards or not, they tell an interesting story about mass psychology. Research here at Elliott Wave International shows that horror films proliferate during bear markets, whereas upbeat, sweet-natured Disney movies show up during bull markets. Since the Dow has been in a bear-market rally for a year, now is not the time for horror films to dominate the movie theaters. But their time will come again. In the meantime, to catch up on why all kinds of pop culture — including fashion, art, movies and music — can help to explain the markets, take a few minutes to read a piece called Popular Culture and the Stock Market, which Bob Prechter wrote in 1985. Here’s an excerpt about horror movies as a sample. Robert Prechter on Herding and Markets’ "Irony and Paradox"
To anyone new to socionomics, the stock market is saturated with paradox. The following is an excerpt from a classic issue of Robert Prechter’s Elliott Wave Theorist. For a limited time, you can visit Elliott Wave International to download the rest of the 10-page issue free. Have you ever watched a dog interact with its owner? The dog repeatedly looks at the owner, taking cues constantly. The owner is the leader, and the dog is a pack animal alert for every cue of what the owner wants it to do. Participants in the stock market are doing something similar. They constantly watch their fellows, alert for every clue of what they will do next. The difference is that there is no leader. The crowd is the perceived leader, but it comprises nothing but followers. When there is no leader to set the course, the herd cues only off itself, making the mood of the herd the only factor directing its actions. To anyone not versed in socionomics, everything the stock market does is saturated with paradox. — When T-bills sported double-digit interest rates in 1979-1984, investors saw no reason to abandon their T-bills for stocks; when T-bill rates were low in the 2000s, investors saw no reason to put up with the “low yield” of T-bills and sought capital gains in stocks. The first period was the greatest stock-buying opportunity in two generations, and the second period was the greatest stock-selling opportunity ever. — When long-term bonds yielded 15 percent in 1981, investors were afraid of Treasury bonds even though they were about to embark on the greatest bull market ever; in December 2008, when the Fed pledged to buy T-bonds, rising prices appeared so strongly guaranteed that the Daily Sentiment Index indicated a record 99 percent bulls, just before prices started to fall. — When oil was $10.35 a barrel in 1998, no one made a case that the world was running out of black gold; but when it was 7-8 times more expensive, some three dozen books came out arguing that global oil production had peaked, a theme that convinced investors to begin buying oil futures…about a year before the price collapsed 78 percent. Increasingly negative social mood is overtaking politics — and the U.S. stock market. Correlation with the stock market, consumer confidence, economic performance and other measures suggests that social mood is by far the main determinant of presidential popularity… There are two reasons for this fact. First, his actions, despite their endless analysis in the press, do little to affect his popularity. Second, his popularity is dependent upon a social mood and economy over which he can exercise no countertrend influence." "Anger in the Air" was the sub-headline on television, when the January 19th election results announced Republican Scott Brown the winner. The meaning was clear: Anger among Massachusetts voters in the U.S. Senate special election led to what would have normally been unpredictable: A Republican beat a Democrat in what is arguably the bluest of blue states. Not since 1972 had a Republican had been elected to the U.S. Senate from the Bay State. Stock market guru and best-selling author Robert Prechter says "You can almost hear the Dow going up and down over the airwaves." Watch this 11-minute clip from his documentary History’s Hidden Engine to see how social mood governs movements in the stock market and trends in popular culture. Access his 50-page report "Popular Culture and the Stock Market" FREE. Access Robert Prechter’s 50-page report "Popular Culture and the Stock Market" FREE! Both a study of the stock market and a study of trends in popular attitudes support the conclusion that the movement of aggregate stock prices is a direct recording of mood and mood change within the investment community, and by extension, within the society at large. It is clear that extremes in popular cultural trends coincide with extremes in stock prices, since they peak and trough coincidentally in their reflection of the popular mood. The stock market is the best place to study mood change because it is the only field of mass behavior where specific, detailed, and voluminous numerical data exists. It was only with such data that R.N. Elliott was able to discover the Wave Principle, which reveals that mass mood changes are natural, rhythmic and precise. The stock market is literally a drawing of how the scales of mass mood are tipping. A decline indicates an increasing ‘negative’ mood on balance, and an advance indicates an increasing ‘positive’ mood on balance. So What’s Behind Moves In Gold? In response to How Will China Handle The Yuan? I received many emails regarding a single statement I made: "Prechter, who does not view gold as money, thinks gold will collapse. Thus, not all deflationists think alike." The first half of that statement "Prechter, who does not view gold as money" is an inaccurate representation of Prechter’s views. Inquiring minds pointed out that the title of Chapter 1 in Prechter’s Gold and Silver eBook (a publication you can download for free) is "Gold Is Still Money". Apologies go to Robert Prechter. That out of the way, there are many things worthy of discussion from the same eBook. Please consider the following image snip. 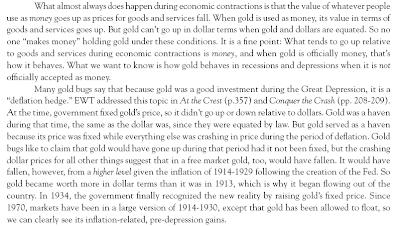 From the chapter: Does Gold Always Go Up In Recessions and Depressions? When Does Gold Act Like Money? While Prechter states "gold is still money", the above paragraph shows that he thinks gold acts differently when "gold is officially money". On the other hand, I think gold is money and gold acts like it as well, regardless of whether or not governments make it "official". Please see Misconceptions about Gold for a detailed explanation. In the eBook, Prechter notes "All the huge gains in gold have come when the economy was expanding". That is a true statement. However, this is a true statement as well: "All the huge losses in gold have come when the economy was expanding." Please consider the following charts. Instead of asking "Does Gold Always Go Up In Recessions and Depressions?" one could easily ask "Does Gold Always Go Up In Expansions?" Gold does not always do anything. However, given that recessions make up minimal periods from 1980 through 2000, this is an accurate representation of the period. The following is an excerpt from Robert Prechter’s Elliott Wave Theorist. Elliott Wave International is currently offering Bob’s recent Elliott Wave Theorist, free. On February 23, EWT called for the S&P to bottom in the 600s and then begin a sharp rally, the biggest since the 2007 high. The S&P bottomed at 667 on March 6. Then the stock market and commodities went almost straight up for three months as the dollar fell. On March 18, Treasury bonds had their biggest up day ever, thanks to the Fed’s initiating its T-bond buying program. The next day, EWT reiterated our bearish stance on Treasury bonds. T-bond futures declined relentlessly from the previous day’s high at 130-15 to a low of 111-21 on June 11. That’s when there were indications of impending trend changes. The June 11 issue called for interim tops in stocks, metals and oil and a temporary bottom in the dollar. The Dow topped that day and fell nearly 800 points; silver reversed and fell from $16 to $12.45; gold slid about $90; and oil, which had just doubled, reversed and fell from $73.38 to $58.32. The dollar simultaneously rallied and traced out a triangle for wave 4. Bonds bounced as well. As far as I can tell, our scenarios at all degrees are all on track. Corrective patterns can be complex, so we should hesitate to be too specific about the shape this bear market rally will take. But from lows on July 8 (intraday) and 10 (close), the stock market may have begun the second phase of advance that will fulfill our ideal scenario for a three-wave (up-down-up) rally. In concert with rising stocks, bonds have started another declining wave, and the dollar appears to have turned down in wave 5 (see chart in the June issue), heading toward its final low. Although commodities should bounce, their wave patterns suggest that many key commodities will fail to make new highs this year in this second and final phase of partial recovery in the overall financial markets.